As so often happens with immigration into the United States, it all began with adversity. And so it was with the Aubuchon Family. On April 3, 1901, a young widow, Georgianna Aubuchon and three of her four teenage children left Canada and entered the United States in search of employment and a better life. They came to Fitchburg, Mass., where the two eldest, William and Arthur began working in the yarn mills. Albanie remained at home with her mother, while John stayed for awhile with an uncle on a farm in Yamaska, in the province of Quebec. At the beginning of the 20th Century many French Canadians were arriving in Fitchburg, Massachusetts to work in the busy mills. The founder of Aubuchon Hardware, William E. Aubuchon (1885-1971), was a member of this industrious group. He labored for several years, saving his wages and dreaming of a business of his own. In 1908, at the age of 23, he bought his first hardware store. He studied the market, purchased merchandise carefully and began to make a profit. William took on his youngest brother, John B. Aubuchon (1890-1981), as a partner in 1913. Together they opened their second store, in downtown Fitchburg, in 1917. By the end of the 1920’s there were 8 Aubuchon Hardware stores in central Massachusetts. In spite of the depression years, the 1930’s brought growth. There were 22 more stores added which included the first locations in New Hampshire. The Company was incorporated in 1934. Aubuchon Hardware continued to expand over the past century. Today the Aubuchon Hardware chain has 130 stores across New England and New York. 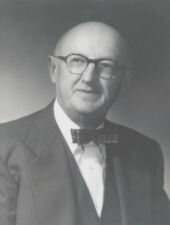 William E. Aubuchon, Jr. became President in 1950 and brilliantly followed in the giant footsteps of his father until 1993. Building upon his father’s foundation, he enlarged the enterprise further. Both William Sr. and his brother John remained active in the daily affairs of the Company until their deaths. Besides the hardware business they were also involved in the funeral business in the John B. Aubuchon Funeral Home and in real estate in the Aubuchon Realty Company. Today, two grandsons of the founder became the new leaders of the W.E. Aubuchon Company. William E. Aubuchon, III was elected Chairman and CEO in 1993 after serving many years as Vice-President of Marketing. In the same year M. Marcus Moran, Jr. became President and Treasurer. The Company is fond of promoting from within, which means that many people involved in management started in one of the hardware stores. This also means that they have many years with the company and are treated as family. This interaction of family and business has helped Aubuchon Hardware prosper for 100 years and will assist it in the years to come.